How well do you know your home? To check how your existing home stacks up in the warmth, health and efficiency stakes, Homestar™ provides independent advice and guidance on energy and performance improvements to the home, as well as professional design and construction services for residential new builds. Developed by the New Zealand Green Building Council and backed by Government, the rating system aims to improve the standard of Kiwi homes by providing a comparison against a benchmark, so home owners can ensure their homes become warmer, healthier and energy efficient thus reducing their environmental impact. 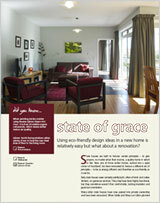 Often you know your home is cold, draughty, damp or overheated but you’re not sure where to start improving it. 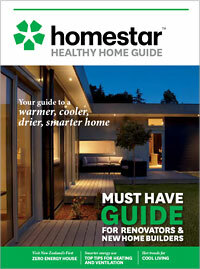 The Homestar™ residential rating tool has been developed to help you get started. It is designed to help you identify what areas in your home need attention and give you guidance and ideas of what you can do to improve them. Homestar™ has been developed to take into consideration the environmental building standards required regionally, by New Zealand’s unique climatic conditions. It allows for both self-assessments by the homeowner, using an online home evaluation report and specialist independent assessment by industry professionals that results in the issue of a formal Homestar™ certified rating. The Homestar™ online assessment covers a wide range of areas such as insulation, heating, water use, waste, ventilation and indoor air quality, among other things, and calculates a value rating, 1-10 stars, based on these factors. Complete the online rating tool and you’ll have a good overall view of your home’s performance in comfort, health and efficiency, as well as useful information on cost-effective options to upgrade or improve your home to improve its performance. In the online assessment, if your home doesn’t meet a specified minimum performance level in core areas of overall warmth and comfort (focused on the ability for the house to achieve healthy winter-time temperatures without using excessive energy), Homestar™ will provide you with suggestions on how to make your home healthier and more comfortable, as well as being kinder to the environment. Some suggestions may involve simple easy actions that involve little or no cost, while others may involve investments that will pay for themselves through lower running costs or other benefits to your household. Once you have made some improvements, you can reassess your home using the online tool and see what a difference your improvements have made to your Homestar™ rating. If you like the idea of Homestar™ but not the thought of working through an online assessment, you might like to consider a Homestar™ homecoach and a Homestar™ Certified Assessment. Homestar™ Homecoaches are available nationwide and can provide assistance with the online assessment and tailor a set of recommendations specific to the homeowners needs. A Homestar™ Certified Assessment will provide a qualified rating for the home, validated by a third party. This will be carried out by trained specialist building professionals covering much great detail than the self assessment. The assessor will spend a few hours at your home measuring in detail all the attributes that contribute to the comfort, health and performance of the home. Once completed you will receive a Homestar™ Certificate of Assessment. Homestar™ is expected to have an impact on property values with a higher star rating providing a competitive edge for some homes on the market. Homestar™ was developed by a joint venture partnership between BRANZ, Beacon Pathway and the New Zealand Green Building Council with the support of the building industry and key Government agencies, the Department of Building and Housing and the Energy Efficiency and Conservation Authority. It is also officially supported by industry partners, including Resene, who have provided assistance to get the rating tool up and running. Find out more about Eddie’s home, which has been renovated and now enjoys a much higher Homestar™ rating. What Resene products should you consider when undertaking renovations to improve your Homestar™ rating? A Resene CoolColour looks the same as normal, but reflects much more heat – so it doesn’t get as hot as a standard paint would. The pigment technology allows the coating to retain its usual visible shade, but gives heat back from the surface, reducing stress on the coating and substrate and keeping them cooler. Resene CoolColour technology is available in a wide range of exterior paints and stains and performs best in dark colours that are the most prone to heat build up. It can be used for areas from roofs and weatherboards to decks and fences. Although it may be hard to believe, these two colours behave the same in test procedures. The test procedure involves fixing thermocouples onto the backs of these panels (ensuring a good thermal contact); shining an infra-red light onto the painted side of the panels and plotting the temperature rise of the panels on the thermocouples. The grey panel is a standard coating. The black panel uses Resene CoolColour pigments. The black Resene CoolColour panel has the same infra-red (heat) absorption as the standard paint finish on the grey panel, demonstrating the reflective benefits of Resene CoolColour technology. Find out more about Resene CoolColour technology. The Resene Curtain Collection is a range of curtain fabrics designed to go with popular Resene paint colours. Curtains are pencil pleat style custom made to your measurements. Choose the thermal blockout backing for extra warmth in winter as it will keep the heat in the room and reduce the cold air being transferred from chilly windows. Find out more about the Resene Curtain Collection. Mould is very common in homes and buildings and has tended to get worse rather than better. This is because modern design has buildings and homes so airtight that moisture can’t escape. Instead the moisture settles on surfaces and creates a prime breeding ground for mould. On painted surfaces, mould looks like dirt, so it’s often hard to tell by looking at it what is actually mould and what is actually dirt. The most common type of mould is black, but others can be brown or green. A quick way to tell whether you are dealing with mould or dirt is by wetting the surface and rubbing. Mould will show up as slime. You can’t just clean off mould with water and a brush, you need to kill it. To tackle moss and mould thoroughly clean down the surface to remove all loosely adhered material. Treat areas of moss or mould infestation with Resene Moss & Mould Killer, correctly diluted (see pack) with clean water. As soon as the mould has been completely de-colourised, which indicates it has been killed, wash thoroughly with clean water to remove residues and then allow to dry. Once dry if the surface paintwork is still in good condition you can leave as is, or if new paintwork is needed, you can prepare and paint as per normal. Consider getting Resene MoulDefender added to your paint as this is a mould inhibitor and gives your paint extra protection against mould. It is also in the Resene Kitchen & Bathroom range – Resene SpaceCote Low Sheen Kitchen & Bathroom, Resene SpaceCote Flat Kitchen & Bathroom and Resene Lustacryl Kitchen & Bathroom to provide extra protection against mould in wet areas. Where you can open windows, doors etc and allow the air to circulate. While you can turn on air conditioners and heaters, some actually exacerbate the amount of moisture in the air. There’s nothing quite like a few windows open in good weather to really refresh the indoor air. As well as mould, bacteria also tend to grow fast in humid or wet conditions and they are more of a problem in kitchens, bathrooms and laundries. Resene SpaceCote Low Sheen Kitchen & Bathroom combines the durability and easy cleanability of a low sheen waterborne enamel with added anti-bacterial silver protection and the mould protection of MoulDefender to minimise bacteria and mould growth. Anti-bacterial silver protection is internationally recognised as a safe and healthy method of deodorising and sanitising surfaces that come in contact with skin, food and water. Use Resene SpaceCote Low Sheen Kitchen & Bathroom on walls and complement with Resene Lustacryl Kitchen & Bathroom on trims and joinery. Or for a semi-gloss sheen throughout use Resene Lustacryl Kitchen & Bathroom formulated with anti-bacterial silver and MoulDefender for your walls, trims and joinery. Both Resene Lustacryl Kitchen & Bathroom and Resene SpaceCote Low Sheen Kitchen & Bathroom are Sensitive Choice approved and Environmental Choice approved products. While mould is growing inside your home, often more mould and moss is growing outside, which can make exterior areas very slippery and also shorten the life of your exterior paintwork and other substrates. Quickly kill exterior moss and mould using Resene Moss & Mould Killer, or for a slower acting less work required option, use Resene Deep Clean. Resene Deep Clean is the simple, safe method of keeping all your outdoor areas free from moss, mould, algae and lichen. Simply spray or brush on and leave Resene Deep Clean and nature to do the work. Slow acting Resene Deep Clean gets right down to the roots of the problem, destroying the growth and combining with U.V. light and rain to weather off the remains to leave a Resene Deep Clean surface. Ideal for use on paths, patios, decks and other exterior cementitious, timber and painted surfaces. Once you have cleaned off the moss and mould, consider using Resene Non-Skid Deck & Path on areas where you are more likely to slip. Resene Non-Skid Deck & Path has a comfortable grit texture that gives shoes and feet something to grab onto, reducing the risk of slipping over. This is especially idea for stairs, sloping paths and areas surrounding pools that become very slippery when wet. Find out more about Resene Non-Skid Deck & Path. If you’ve added insulation or made other changes inside your home, chances are you’ll need a final paint finish to complete the job. If you’ve worked to make your home more comfortable, healthier and efficient, keep those attributes in mind when choosing your paint finishes. Opt for Environmental Choice approved, waterborne and low or no added VOC paint options wherever possible. Resene has an extensive range of Environmental Choice approved products suitable for inside and outside your home, from primers and sealers to paints and stains. These products are also waterborne so are quick and easy to clean up in water and generally much lower odour than solventborne products. Resene Zylone Sheen Zero, combines the popular low sheen of Resene Zylone Sheen with no added unwanted volatile organic compounds (VOCs) for better indoor air quality. Or for a more durable finish you can choose Resene SpaceCote Low Sheen, which combines a desirable low sheen finish with low VOCs and an easy care surface. A VOC is a volatile organic compound – in the case of paint, this is solvents that are released into the air as the coating cures. Most waterborne paints now have VOC levels of 100gms or less per litre. Traditional solventborne paints have considerably higher levels of VOCs – sometimes 500gms or more per litre! Improved air quality can help prevent headaches, asthma, nausea, respiratory complaints and allergic reactions. When you add the tinter to paints, often you add VOCs too. Resene pioneered the development of Resene no added VOC tinters, so you can get your favourite Resene colour tinted in store without unwanted VOCs. Thousands of colours, no added VOCs. Keep your home’s paintwork clean inside and out with the Resene cleaning range. Outside use Resene Paint Prep and Housewash for a quick annual washdown. This will help to wash away dirt, grime and other contaminants to keep your paintwork looking and performing better. Inside you can use Resene Interior Paintwork Cleaner to clean painted areas. Always follow the Resene Caring for your paintwork instructions when you are cleaning painted areas. See the Resene Caring for your paintwork instructions. Many projects that are done to improve Homestar™ ratings, such as adding insulation will need to be finished with paint once the renovation, insulation or building work is done. Resene has an extensive range of paints, coatings and colours and an extensive range of wallpaper suitable for all your home projects. Find out more about the recommended paint systems to use on your home. View the Resene product list. View the Resene online wallpaper library. View current Resene colour charts.